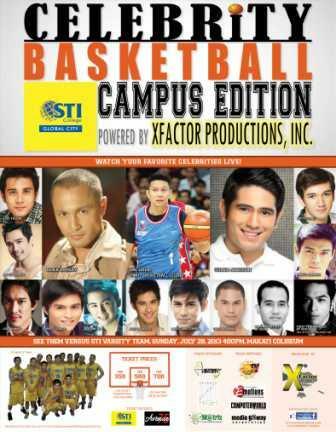 The country's brightest and hottest actors namely Gerald Anderson, Matt Evans, Ejay Falcon, James Blanco, Marco Alcaraz, Jose Sarasola, and Derek Ramsey will fight for the MVP title in the upcoming Basketball Tournament dubbed as Celebrity Basketball Campus Edition! The event is a Campus Edition since the said celebrities will face-off the STI Varsity Team in one powerful brightest battle! The event will took place on Makati Coliseum this coming July 28, 2013 at 4pm. This is a live battle brought by the XFactor Productions Inc. in partnership with the STI College Global City Campus. The PBA icon Bal David will also grace the event. So what are you waiting for, reserve your tickets now and see your favorite celebrities battling over your campus crushes!